Hope you are all geared up and ready for this weekend's Halloween festivities. The Frank Family is all set, costumes are purchased, candy is ready, pumpkin is waiting. Except that we don't dress up...but the dog does! 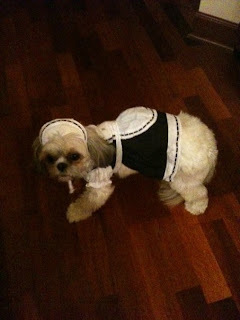 This year she begged and pleaded to be a French Maid, rather than a hot dog like last year. And except that we live in a condo building so there will be no cute children coming to our door dressed up in costume to hand out said candy. So Jeremy will be consuming it all. And except that again, we live in a condo building, so our pumpkin is sitting on our kitchen table, rather than on the outside stoop. So it's a modified Halloween. With dog costumes, and pumpkin clad kitchen tables, and a husband stuffed full of candy intended for children. Someday we'll have a house, and you know this girl will have that thing decorated to the hilt with cobwebs, and spiders, and pumpkins galore! And knowing me, I will craft some type of door decoration that will necessitate 3 trips to Michael's, 2 trips to Target and a last minute Jo Ann Fabrics run, just to make the perfect Halloween door decor. But until that time, our condo is ready for the holiday! In health news. My husband has gone crazy. And I mean that in the kindest way. Yesterday for lunch he visited his favorite outpost known as Chipotle. Upon finishing his burrito bowl the employee sneezed near the bowl. Jeremy paid, walked out the door, and then threw away his uneaten lunch. Afraid the sneezing culprit had H1N1 and may have gotten his sneezing germs on the lunch. Now I don't disagree with this philosophy, but I do disagree with the financial implications. He paid for the lunch! Return it. Make a stink. Inform them that there is this funny thing called the swine flu going around and you are not interested in catching it from your lunch. But pay for it? I don't think so. Oh, well. Instead he enjoyed a delicious lean pocket. And that is the most embarrassingly delicious thing that the Franks have now learned to enjoy for lunch. Just 5 WW points, of pure delight. No joke, try the lean pocket. And tell em we sent you. Chicken & spinach (or something like that) = delish. 3 reasons for buying a house: yard space, sound-proofing, and holiday decorating.